1 Funko Pop! smaller size 3 pack protector! These fit the newer slimmer size that Funko has been coming out with lately. 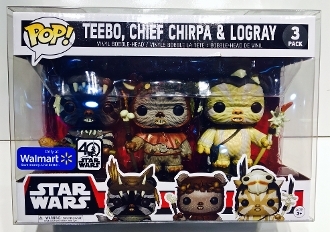 Ewoks, Cloud City, X-Wing Pilots, Flash Chrome, Wonder Woman Chrome, Rush 3 packs, Ad Icons Snap Crackle and Pop and David S. Pumpkins. There could be other too! These also fit 2 standard 4" Pops! side by side in this one protector! These do NOT fit the Unhooded Emperor or Greedo Walmart 3 packs, Death Star 3 pack, Sailor Moon, Rampage or Wrinkle in time. If you have any not on this list and you are unsure please measure yours and let us know the dimensions please.